Very professional, and they did a great job for us. They were on time, and when they gave us a time frame to be there, they were right there. If you have a tow truck matter, call Ramirez. He knows what he is doing, he is punctual, and he doesn't overcharge. They really helped me out. They had incredible equipment to execute the job, and they seemed to know what they were doing. They were very professional and responsive. Ramirez Tow provides towing services for medium and heavy duty vehicles throughout Napa and Solano Counties. 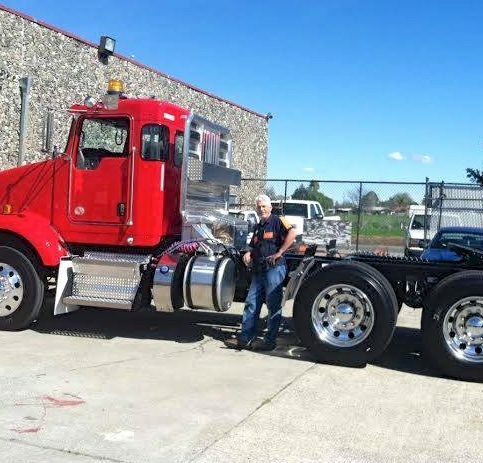 The family-owned and operated company utilizes its sizeable fleet of flatbed/lowbed trailers and tow trucks to handle a wide variety of towing situations, and it’s also qualified to perform overload adjustments on commercial trucks that need to be cleared at weigh stations before reaching their destinations. Owner Steve Ramirez secures a customer’s vehicle to his flatbed tow truck. Ramirez Tow has been providing towing services for light, medium, and heavy duty vehicles throughout Solano and Napa Counties since 1976. The family-owned and operated company has a sizeable fleet of flatbed/lowbed trailers and car transporters to handle a variety of towing situations, and it’s also qualified to perform overload adjustments on commercial trucks that are legally required to clear weigh stations before reaching their destinations. If your commercial truck breaks down and you need a tow, make sure you provide the dispatcher with detailed information. When commercial truck drivers end up on the side of the highway, the first thing many of them think about is getting assistance as soon as possible, which is why some drivers get frustrated when they’re met with a line of questions from a tow truck dispatcher. However, if you find yourself in this situation, it’s important to remember that a dispatcher must get detailed information in order to ensure accurate and efficient service. Q: What’s your typical response time? A: It depends on where you are and how busy we are, but typically, we can get to you within 30 to 45 minutes. Q: What if you don’t have any drivers available? A: We network with other towing companies, so if all our drivers are busy or you’re outside of our service area, we can refer you to one of them so you can get faster service. Q: Can you give me an estimate on how much my tow will cost? A: Yes. In addition to our hourly rate, we have a structured price sheet that addresses aspects like distance, travel time and equipment, which enables us to give fairly accurate estimates. Q: Do you expect payment at the time of service? A: Yes, unless you have an ongoing account with us. Q: Can you move other vehicles besides trucks? A: Absolutely. We’ve moved all kinds of vehicles, including helicopters and yachts, and we also offer forklift services. Q: Are your employees properly trained? A: Yes. In addition to having their Class A licenses, all our drivers are certified by the California Tow Truck Association. Steve Ramirez is a 43-year veteran of the towing industry and owner of Ramirez Tow, a Diamond Certified company. He can be reached at (707) 277-1913 or by email. Q: What was your first concert? A: Chicago at the Oakland Coliseum back in the 1970s. A: Summer—I get to ride my Harley more often, and my job is a little easier in good weather. A: Dog person—we have a boxer mix named Minnie and a little beagle named Lulu. Q: Who’s your favorite actor? SUISUN CITY — While a bill of sale and transfer of title are both crucial documents for selling a used vehicle, one that sometimes gets overlooked is the Release of Liability form. However, by neglecting to submit this document, you may end up getting an unexpected parking ticket or tow bill in the mail. A Release of Liability form is exactly what it sounds like: by submitting it when you sell your vehicle, you’re informing the DMV of the sale and formally divesting yourself of any liability. By failing to submit this form, you put yourself at risk—since your name is still attached to the vehicle, if its subsequent owner gets a parking ticket, moving violation or towing fee, a government or tow company representative may contact you to collect payment. According to California law, Release of Liability forms are to be submitted within five days of the sale date. Forms are available to download online or for in-person pickup at any DMV office. After filling it out, you can submit the form via mail, online or in person. SUISUN CITY — Host, Sarah Rutan: Following the sale of your used vehicle, the last thing you’ll want to receive is a bill for a parking ticket or a towing fee. Today, we’re in Suisun City with Diamond Certified Expert Contributor Steve Ramirez to learn about the release of liability forms and why they matter to you. Diamond Certified Expert Contributor, Steve Ramirez: I wanted to let the viewers know how important it is to properly fill out a DMV release of liability when you sell your automobile. We have people come here all the time that have sold vehicles, they have been towed in, impounded, and they have no proof that they sold the vehicle. Therefore, the government, the state, is still after them for any tickets and we would be after them for the tow bill. So, it’s very important to get that release of liability into DMV the minute you sell a car. Ramirez Tow : Average 9.6 out of 10 based on 175 unique customer surveys of customer satisfaction. They have always been really reliable. We can count on them. They do a good job. I don't have much to do with it, but they are good. We keep using them. Nothing specific, they just get the tow done. Ramirez Tow is our go-to, preferred company to use for our trucks. We have larger industrial trucks, which takes a higher skill level to tow. They have it figured out. They know what they are doing. They have never damaged a truck of ours. We dispatch larger trucks for pipe repairs, linings, and whatnot. The trucks are big, so when they break down, we need a company that can handle the trucks, and they do a great job. They are also very helpful in other ways, more than just towing. They are reliable. We can count on them. They are good. They have a very nice dispatcher and knowledgeable technicians. They are a "10" all the way around. We have never had any issues with them. They are responsive, like within the hour. They are good. Everyone was busy, so we had to wait, but that was about it. They did great. They were really good on the phone. I called a few others that couldn't help, so they were able to be there and do the job. They are good. I prefer not to use anyone else. They have a good team. They are very efficient, timely, and get out to people quickly when they are under distress. They are always able to help us and our customers. They are quick and know what they are doing. I think the fact that they are quick is key. With all of the broken down equipment that we encounter, they are really good at what they do. I think that they got to the site within a few hours is what I liked most. I think they are a great operation. We use them for all of our fleet tows. Nothing that I can think of. They get the tow done, nothing special. I've been using them for a number years. I recommend them all of the time. They are friendly, effective, efficient, and helpful. I would absolutely recommend them and I do. They saved our trucks. They are fast and efficient. They give a time frame, and they are there. They have been great for us. They have helped us get our transports back to the yard many times over the years. They are our go-to people. They are on time, they have good rates, and they know what they are doing. Just what I mentioned, plus they are an all around good, local business. They are great. We can always rely on them for any break-down help. They get there as quickly as possible. I think they have reasonable prices, and they do a great job. They were very professional when they came out, they were clean, and their trucks run well.